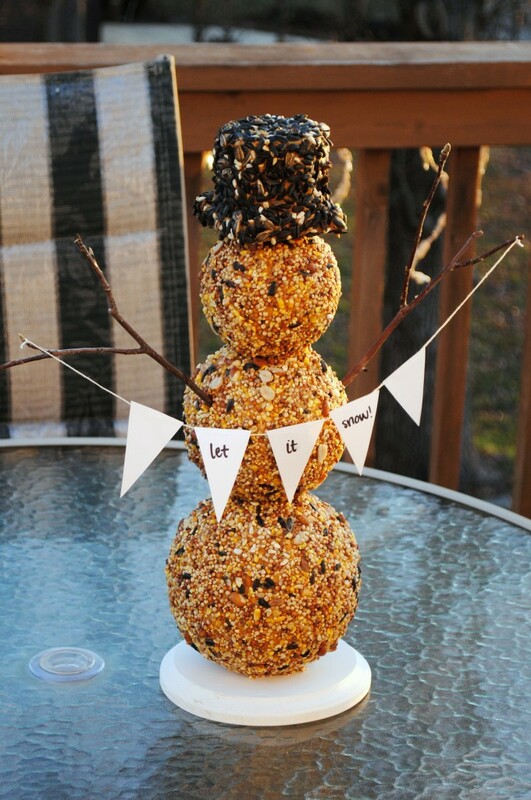 In honor of the week’s snow storms, I have a snowman you can make from the comfort of your warm and toasty home. Your feathered friends will love you for it! But then you should head outside to make a real one — you know, for those of us who will go without! 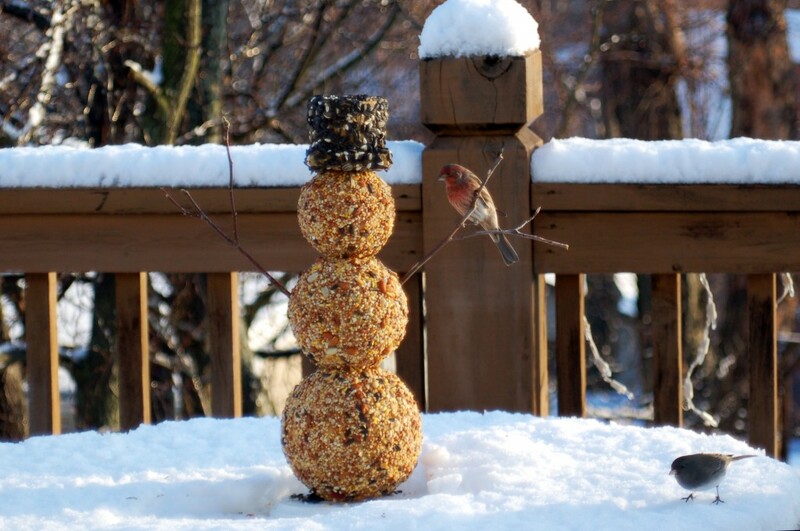 Greg and I made this bird seed snowman for my mom as a Christmas gift. She, like many of us, has a few categories of gifts that she is always happy to receive. My dad loves Notre Dame and beer, my sister-in-law loves all things Anthropologie, and my mom loves snowmen and birds. 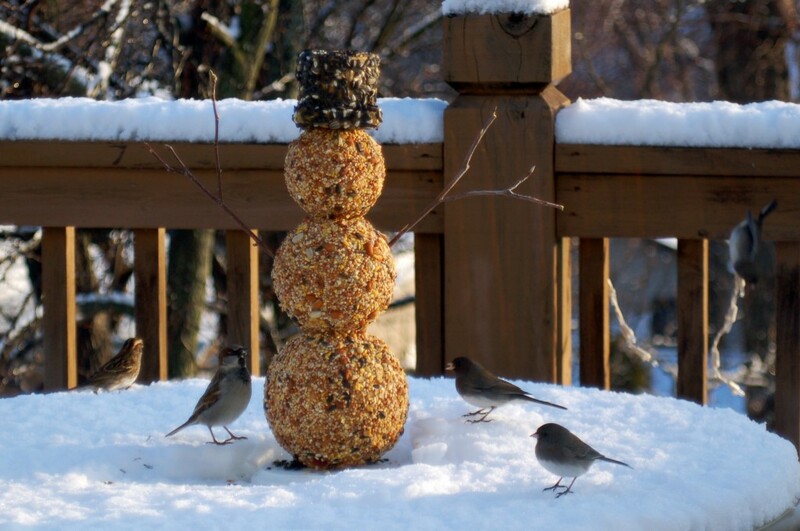 In fact, my mom already has a snowman bird feeder — he’s a cute little statue that holds food in the brim of his hat. But according to the windowsills and walls of my parents’ house, there’s no such thing as too many snowmen! The little “Let it Snow” banner was purely decorative. 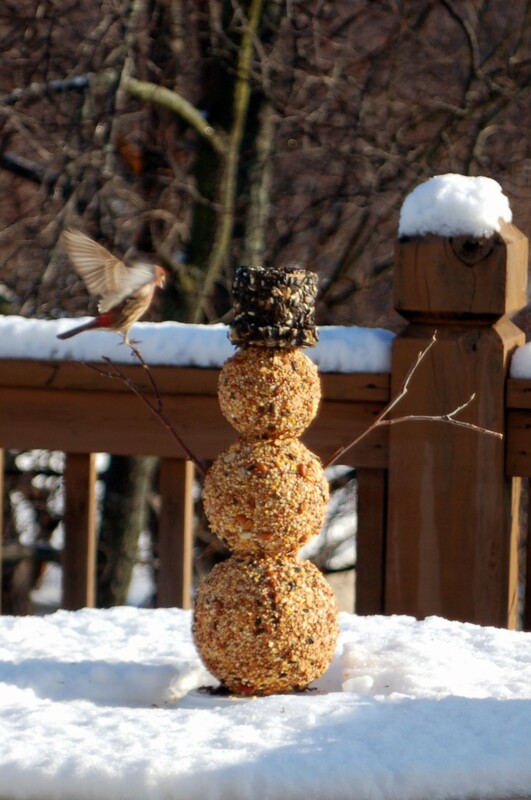 It can’t withstand the elements (it’s just Sharpie on copy paper), but it makes a nice addition to a gift bird feeder. The hat is also optional — we made it from an odd piece of foam that’s half cubical and half cylindrical. I’m not sure how easy it is to find that sort of vase foam, but we got everything but the bird seed at Michaels. Vase foam — a cubical section of foam attached to a cylindrical section. 1. 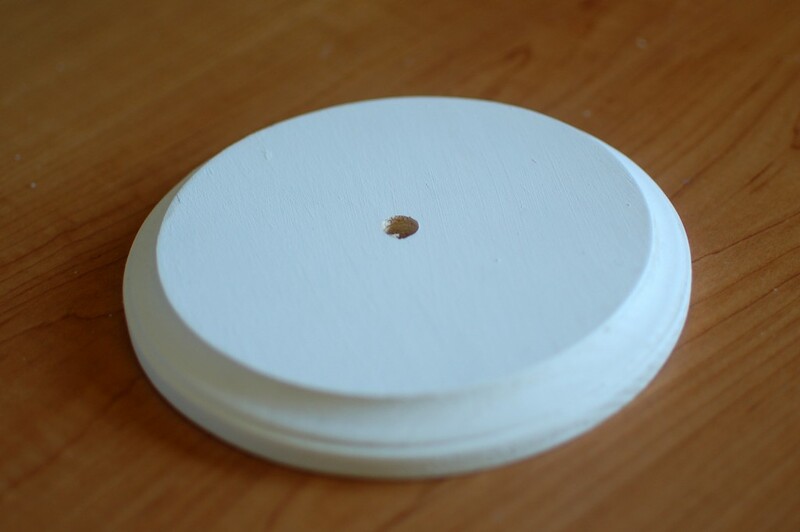 Using a 3/8″ bit, drill a hole through the center of the wooden disc. 2. Paint the disc white. 4. Sharpen one end of the dowel with a file or razor. 5. 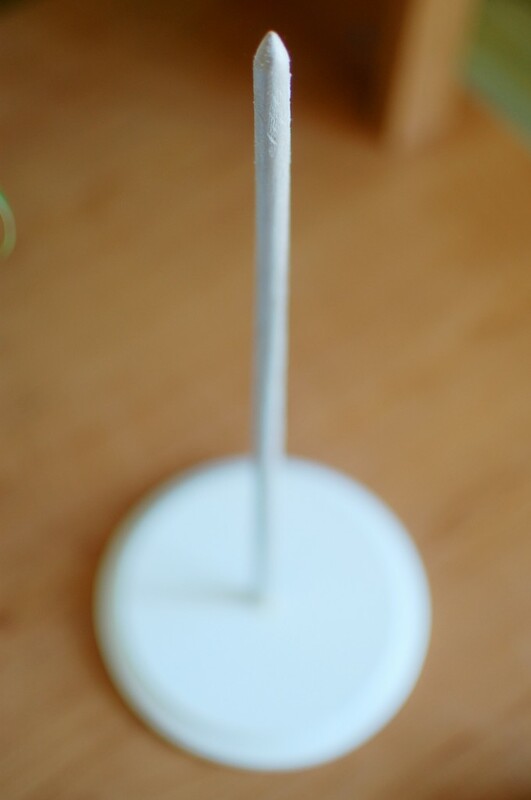 Put glue on the flat end of the dowel and insert it into the hole at the center of the disc so that the end of the dowel is flush with the underside of the disc. Set aside to dry. 6. Cut both ends of the vase foam with a serrated knife to create the hat. A thin square section of foam serves as the brim and the cylindrical part serves as the top. 7. 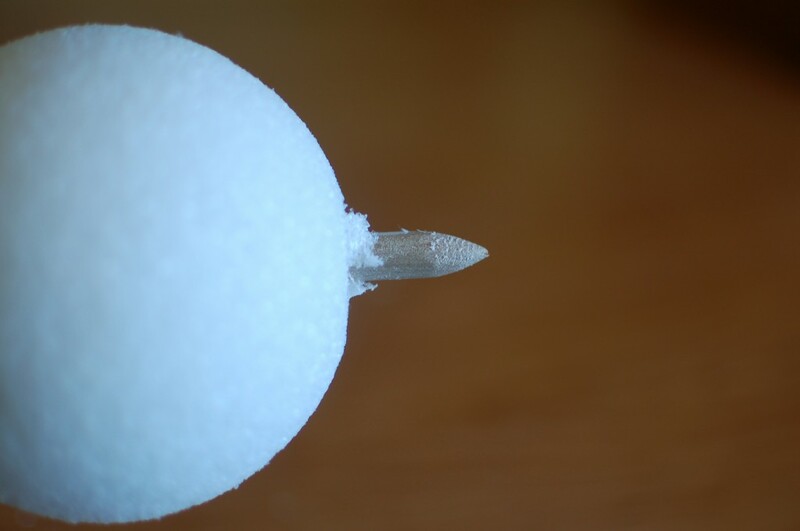 Use the pointed end of the dowel to skewer the center of each foam ball and create a hole through its center. 8. 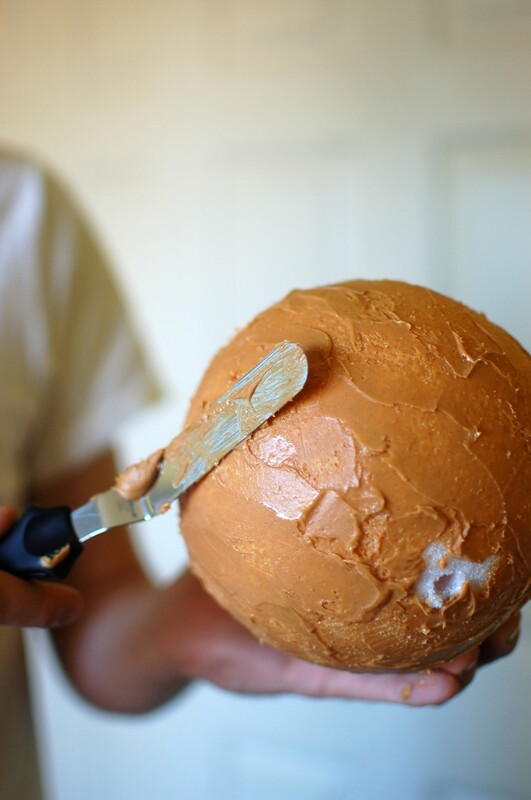 Using a knife or icing spreader, spread peanut butter over the entire surface of each foam ball and the hat. 9. 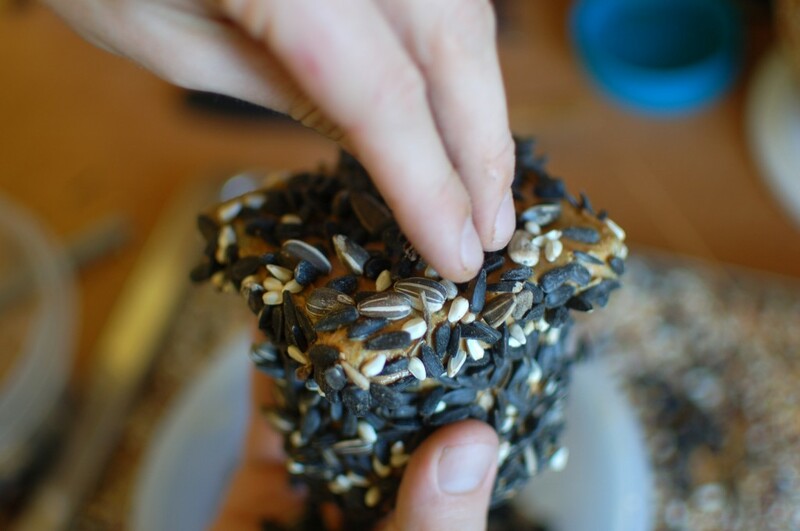 Spread the bird seed out on a tray or in a shallow dish. 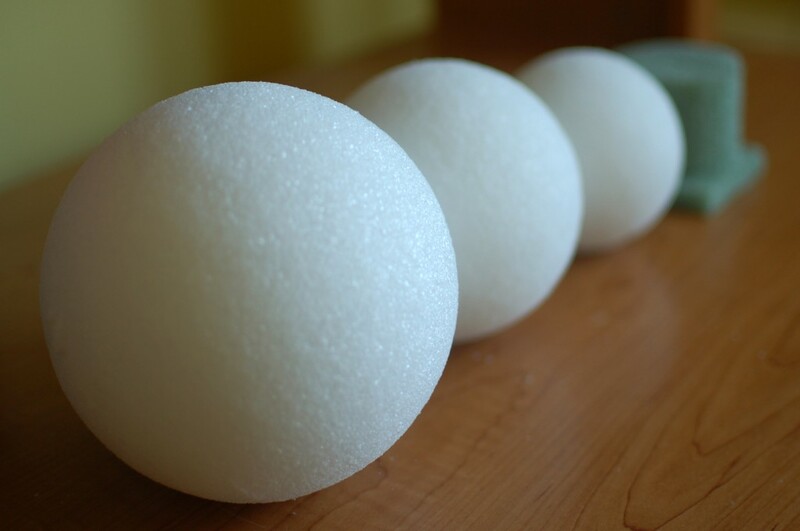 Roll the foam balls to coat. Fill any holes by pressing seed into the peanut butter with your hands. 10. Once the glue on the dowel has dried completely, slide on the snowman body parts from biggest to smallest, followed by the hat. Apply pressure to the top and bottom to squish the foam balls together a bit. 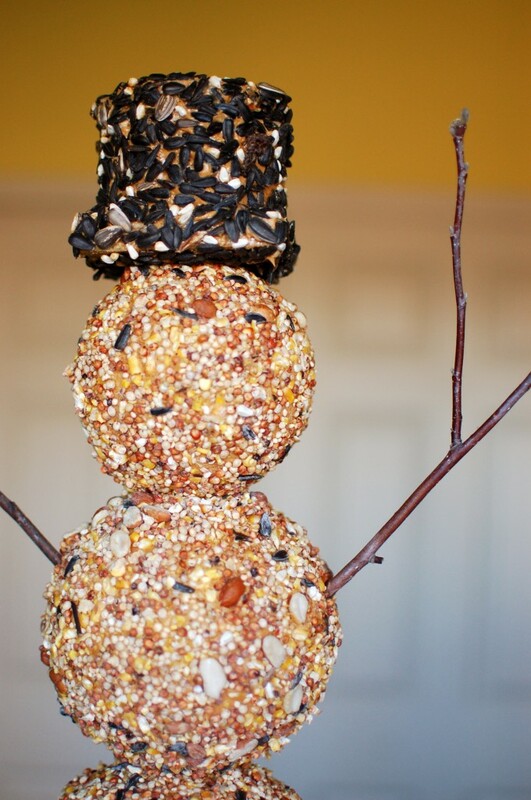 They’ll flatten out a little for a more natural snowman shape. 11. 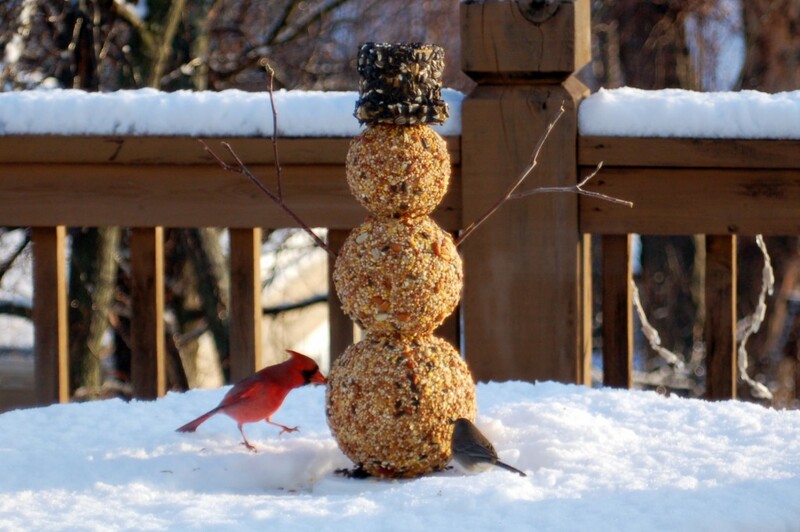 Cover the hat with sunflower seeds and add it to the top of the foam balls. 12. Add two branches to serve as arms. 13. Optional: add cute banner! Hi. Very cool idea but is the foam safe for the birds???? They won’t eat it??? Just curious. Thanks!